So we are expecting to see up to 50 boats brightly decorated at the best to entertain the children as well as adults alike. The boats will be watched cruising through the Bridgewater Channel that starts in Thomson Bay. The journey will continue through the London Bridge up to the north end of the Channel. There will be turnaround at Windsor Beach. So just pack your back to enjoy the stroll through the Channel as it is the exclusive moment when you get to see the mesmerized look of the Channel packed full of boats in the winter night. If you want to create some unforgettable memories following the popular holiday tradition, it is the best occasion to join with your family and friends. Are you wishing to enter your boat in this boat parade? Everyone is cordially welcome as there are lots of prizes offered for this grand event. Prizes include Grand Marshal’s Award, Best Family/Individual Award, Commodore’s Award, Best Corporate Entry Award, Judge’s Choice Award, Best Service Club/Organization Award and Best Sparkle Award. Doesn’t it sound exciting enough! 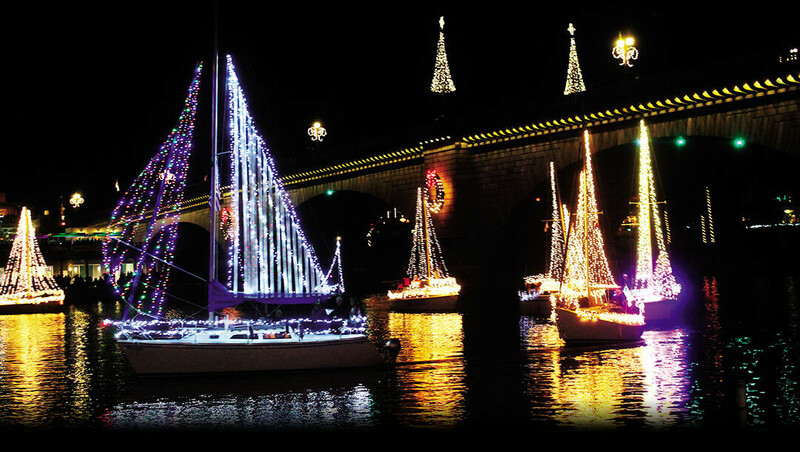 Then the sponsors and participants of Boat Parade event are inviting you to explore the docks before the London Bridge Resort where you can see the lighting up of the parade floats beginning at dusk. People attending the event will be allowed to enjoy bonfires through the Channel on the island side beach areas. However, they must carry a portable, self-contained fire pit and remove all ashes entirely and leave the area clean enough. No one is allowed to dig the fire pits in the sand. Even dumping of ashes in the water is not allowed throughout the event. Remember that the entire area will be patrolled during the event on that evening. Attractive view points of this event include the Nautical Beachfront Resort (which is also the starting point of the Boat Parade of Lights), the Rotary Beach, across the London Bridge, both sides of the Channel throughout between Rotary Beach and Windsor Beach, the English Village and from any restaurant beside the Channel. Remember that if you are planning to view the event from any Channel restaurant, you are recommended to reserve it early. The great news is that you will not be charged a single penny to view the 34th Annual Boat Parade. There is adequate parking facility available at the English Village and other parking areas on the island of the Channel. Before the traffic of the London Bridge becomes congested, you should plan to reach there earlier. Remember that event dates, times and other details are subject to change.